This study is motivated by a growing popularity of artificial neural network for process modeling and regression problems. However, many ANN regression application studies are performed by ‘expert’ users who have a good understanding of ANN methodology. Since the quality of ANN models depends on a proper setting of ANN architecture and ANN meta-parameters, the main issue for practitioners trying to apply ANN regression is how to set these parameter values (to ensure good generalization performance) for a given data set. Non-expert users face a difficulty in finding an optimum ANN architecture and are often confused about how to choose the ANN meta parameters. The present paper addresses this issue and develops a new hybrid procedure to find the optimum ANN architecture and tunes the ANN parameters, thus relieving the ‘non expert’ users. This method incorporates hybrid artificial neural network and differential evolution technique (ANN-DE) for efficient tuning of ANN meta parameters. 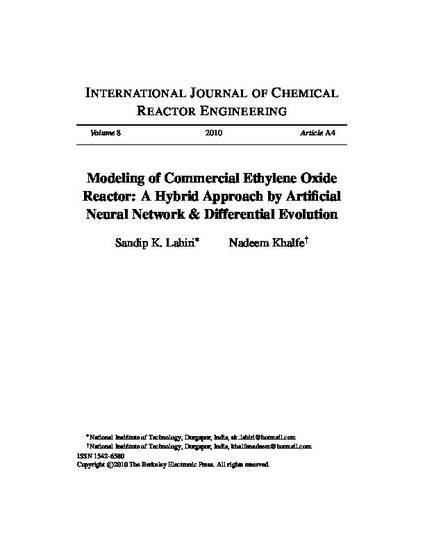 The algorithm has been applied for modeling of a commercial ethylene oxide (EO) reactor. The model developed through this hybrid algorithm can predict the EO reactor output with only 0.4% error.